Puppies are a joy, but they require a lot of preparation before their arrival. While nature does most of the work in delivering the litter, you need to be ready to assist. Your dog will need you to provide her with a safe, warm and quiet spot where she can deliver the puppies and raise them for two to three months. It requires commitment to prepare for the birth of your dog's puppies. Speak with your vet to make certain your dog is having a healthy pregnancy and will be able to deliver her puppies without a Cesarean section. Some breeds have problems delivering their puppies without assistance from a vet. Have a sonogram done midway through your dog's pregnancy. When the puppies arrive, you will know how many are going to be born. Build a whelping box. The dimensions will depend on the breed of dog you have. It needs to be large enough for the mother to lie down and move around comfortably with her litter. The sides need to be high enough to keep the puppies in the box and low enough for the mother to be able to jump out easily. Line the inside of the box with soft towels and a folded blanket that can be washed. Choose a quiet spot in the house for the whelping box. When the mother delivers her puppies, she will need a calm, isolated place where the door can be closed. It needs to be in a room that can be heated to 80 degrees for the first several days after the puppies arrive. A portable heater will be needed. Heating pads should not be used in the whelping box, as they can cause burns. Find someone who will assist you during the delivery. It is important to get the puppy breathing when it is born. This is done by rubbing the puppies with a towel to clear the birth sac off the puppy and to stimulate it to breathe. Another pair of hands will be helpful. Gather dental floss to tie off the umbilical cord, scissors to cut the cords and a bulb syringe to clear out the puppies' mouths. Keep these by the whelping box for the delivery. Purchase a digital scale. 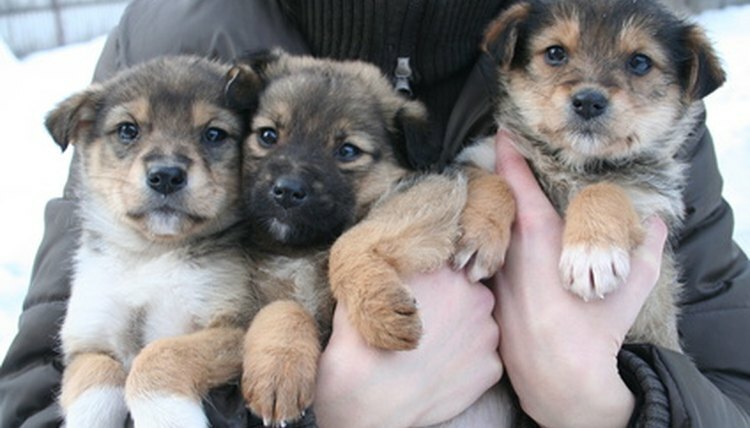 Each puppy should be weighed at birth. Records should be kept to track weight gain or loss for each puppy. Read extensively about delivering puppies so you know what to expect and what problems to arise. Keep in close contact with your vet. The first week after the birth is a dangerous time for both the puppies and the mother. Make certain the room is kept warm and that the mother is nursing all of the puppies.The mother needs to be eating and drinking well. You should be prepared to sleep in the same room for the first several days to monitor the puppies. Dog Play: Thinking About Breeding Your WonderfulDog?